WHO YOU GONNA CALL? A NEW TEAM. Everyone knows the words “If there’s something strange in your neighborhood, Who you gonna call? Ghostbusters! If there’s something weird and it don’t look good, Who you gonna call? Ghostbusters! I ain’t afraid of no ghost…etc.”. Such is the iconic song (sung by Ray Parker. Jr) from the 80’s movie Ghostbusters. Debuting back in 1984, the film followed three quirky parapsychology scientists (Peter, Ray, and Egon) as they launch a ghost-catching business as paranormal events begin to occur in New York City. In short, the film went on to be a hit, becoming a surefire classic in the movie world. Following the film’s success, a franchise tag was given to Ghostbuster, including a sequel movie in 1989 (i.e. Ghostbusters II), two animated television shows (The Real Ghostbusters and Extreme Ghostbusters), as well as various toys and a couple of video games. Now, after 32 years since the first movie, Sony / Columbia Pictures is revamping the franchise (with a female-cast) in the movie tilted Ghostbusters. Does this female reboot live up to the original or is it just another unnecessary long-overdue movie that didn’t need to be made? Trying to present herself as a respectable college professor (hoping for her tenure), Erin Gilbert (Kristen Wiig) is suddenly pulled back into her previous life as a paranormal investigator when her old partner, Abby Yates (Melissa McCarthy) returns to her life, joined by quirky nuclear engineer Jillian Holtzmann (Kate McKinnon). Coming into contact with an actual ghost apparition in New York City, the women decide to open a business dedicated to exposing / vanquishing the haunted spirts, with newcomer Patty Tolan (Leslie Jones) soon becoming part of the team after the MTA worker has a “close encounter” with the ghostly dead. 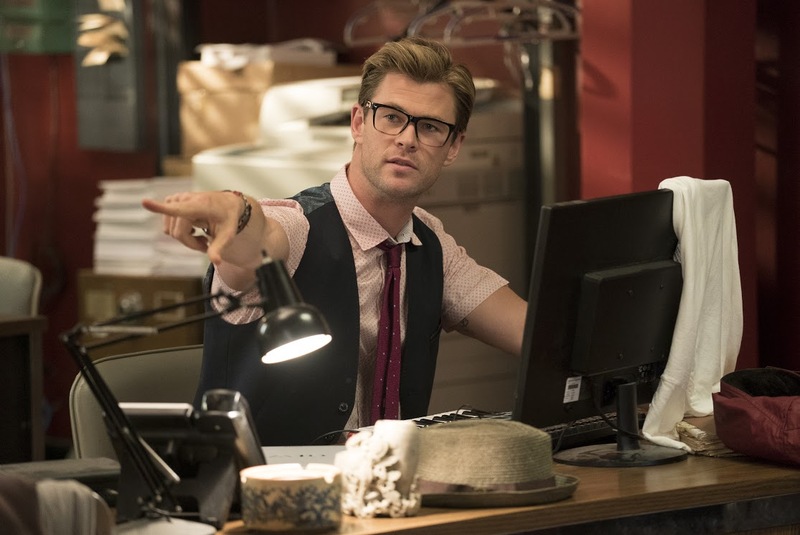 Hiring the handsome but dimwitted Kevin Beckman (Chris Hemsworth) as their receptionist, the team, calling themselves the “Ghostbusters” are ready to take action and hit the streets in search of paranormal activities, while also dealing with non-belivers from the public eye. 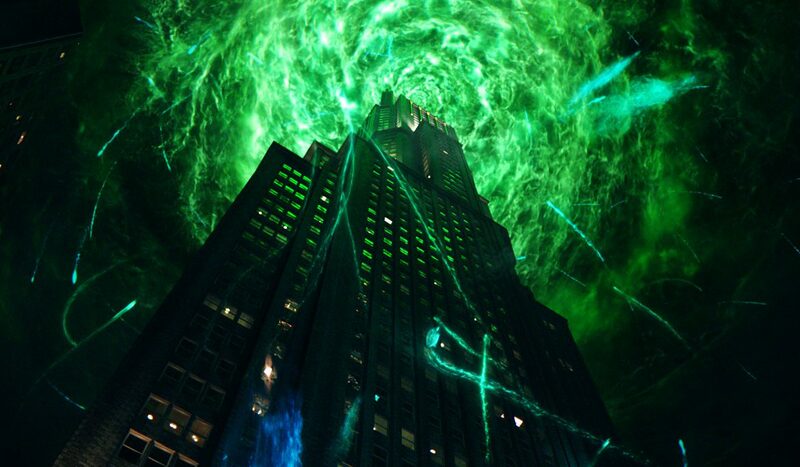 Unfortunately, the team quickly realizes that a threat is developing by Rowan North (Neil Casey), a local New Yorker outcast who’s secretly planning a scheme to bring about a spectral apocalypse. I will say that I’ve watched Ghostbusters (both the original and its sequel), but, while it’s been a fan-favorite amongst fans and movie aficionados, they aren’t my favorite. Don’t get me wrong, I do like the movie Ghostbusters, they just aren’t my top favorite movie to see. Growing up, I do remember watching the animated cartoon show The Real Ghostbusters. Now that I do have fonder memories watching than the live-action movies. What I didn’t know (just found out after doing some online research) is that Ghostbusters 3, the third installment in the franchise, was (or rather) had been in development for years, with various ideas and concepts that were rejected and shot down. What fans got what was a bit different from what they were expecting. Like many out there, I was skeptical after seeing the trailers for the new Ghostbusters movie, especially since it was reboot of sorts as well as a new spin by making it an all-female cast. However, I wasn’t one of the “pre-release” haters out there who scoffed at the movie trailers, calling it “the most disliked trailer on YouTube”, as I kept on opened-mind when I went to see it. What did I think of it? Well, despite a few nitpicks and its overall tardiness as a movie (more on than below), Ghostbusters is a quasi-reboot film that pays homage to the original, while bringing its own comedy antics for a new generation to experience the supernatural frivolities. It may not surpass the original, but it was still entertaining. Ghostbusters is directed Paul Feig, who is known for his recent comedy hits such as The Heat and Spy, As Feig comes from directing comedy, the director certainly brings his own comedic-style when crafting this recently reboot film. So expect a lot of jokes and gags throughout, most of which are quite funny and hilarious. Although I wouldn’t say that Ghostbusters is funnier than The Heat or Spy, but the movie certainly does better than some recent comedy movies. Feig also presents a lot of large set-pieces for particular scenes that involves comedy beats and ghostly visuals that are peppered throughout the feature, effectively creating a visual feast for the eyes through the camera lens as well as laughing at various moments. Additionally, as the movie is PG-13, the paranormal beings in the movie aren’t super scary and are approachable for the younger teens (possibly even tweens) to see this movie. While Feig is known for creating comedy features, Ghostbusters represents his first true “blockbuster” type movie, with visual effects, a supernatural plot, and a “big, bang, boom” summer movie flair to the proceedings. And here lies the first problem with the movie. Feig, while does an admirable job, gets a bit muddle while trying to juggle all the film’s aspects. Naturally, of course, Feig tends to lean towards comedy rather action or story, so, while I said the comedy is funny in the movie, several plot points and the overall villainy of the film takes a backseat along with the character development. Although I didn’t expect this movie to have super-deep character development, but more on the below. Addressing the “big” elephant of the feature is that Ghostbusters (as a whole) feels a bit unnecessary. Yes, I did like the movie, but in all honesty…the movie didn’t need to be made. As I said when I posted the trailers for the movie, the Ghostbusters franchise didn’t scream to be rebooted and revamped, even though Ghostbusters 3 was in long development. Thus, this new movie feels somewhat superfluous in general and vaguely runs the line of long-awaited sequels of the 2016 movies. Beyond that, the movie seems a bit predictable as the feature presents an origin story for this new team with a big showdown at the end. Speaking of the showdown, without spoiling it, it’s a little similar to the ending of the first movie (you’ll know when you see it) as it feels that Feig and his writers were just a bit lazy to come up with their own final battle showdown. Of course, the big draw for the movie (or rather the big controversy) surrounding the movie is the casting of an all-female “ghostbusters” team. And while, some might disagree the decision, it actually helps or rather the four actresses that were chosen for the lead roles help the effort or (at the very least) make it bearable (again it depends on where you stand on the movie). As I personally enjoyed the movie, I actually found the four actresses great in their roles. Melissa McCarthy, Feig’s collaborator in his recent movies (The Heat and Spy) leads the charge as team leader-esque Abby Yates, while Kirsten Wiig follows behind with her character of Dr. Erin Gilbert. Both McCarthy and Wiig are the two “big ticket” actresses of the four and definitely are presented that way, with each one getting the screen-time and their characters’ friendship serves as the emotional weight for the feature, which juxtaposes the zany and wacky antics of their co-stars and the supernatural threats of paranormal ghosts. While McCarthy’s Abby and Wiig’s Erin somewhat “anchor” the movie, the more surprising (and perhaps the more entertaining ones of the bunch) comes the two unknown stars of the grouping. First, there is Jillian Holtzmann played by Kate McKinnon. While the character isn’t something original per-say, McKinnon completely owns the role of Holtzmann, creating a very cheeky / weird vibe when explain flat exposition lines of scientific dialogue. In short, she’s downright funny in the movie. The same goes for Leslie Jones’s character of Patty Tolan, who presents a hilarious comedic performance as the relatively newcomer to all the paranormal activity. Again, each one of the four brings something (comedic) to the movie, highlighting their talents as character actresses. Although, the Feig provide enough room for the team to grow beyond the initial premise of each character (i.e. Abby is the leader, Erin is the reluctant individual, Holtzmann is the weird / off-kilter member, and Patty is the outspoken member). Still, on the other hand, it works for what the movie wants to achieve. Assisting the four lead ladies is actor Chris Hemsworth as the Kevin Beckman, the so-called actor-turned-male receptionist. Kevin’s dopey and dimwitted personality fits perfectly with Feig’s work as Hemsworth (surprisingly) delivers the goods, adding a very interesting layer to Hemsworth’s theatrical body of work. Unfortunately, the same can’t be said for Neil Casey’s character of Rowan North. Yes, he’s the catalyst for the villainy in the movie, but it’s not interesting nor is it enjoyable to watch him on-screen. In short, he’s a weak baddie. Smaller cameo-like roles are given to some recognizable faces, including Game of Thrones alum Charles Dance (He’s been getting quite a lot of work since playing Tywin Lannister) as Harold Filmore (Dr. Erin Gilbert’s academia superior), Matt Walsh and Michael Kenneth Williams as Agents Rourke and Hawkins, Andy Garcia as NYC Mayor Bradley, and finally Michael McDonald and Zach Woods (both whom have played smaller roles in Feig’s other films) play fun little roles in this movie. As a final note, Ghostbusters does bring back a lot of familiar faces from the original Ghostbusters movie. I won’t say who’s in it, but rest assured there in in the movie and make some great cameo appearances. Who you gonna call? Well, a new paranormal team that who is in the movie remake Ghostbusters. Director Paul Feig’s newest feature reboot of an all-female central cast to the beloved “ghost-busting” franchise does have highlight pieces, especially in its four lead actresses, as well as in its visual effects, comedy beats, and cameo appearances. Unfortunately, the movie definitely has an air of “superfluous” (in general), while Feig sometimes struggles to find his footing in its own blockbuster premise as well as some similarities to the first installment. Personally, I thought this movie was good, a bit unnecessary, but still worth the price of admission and held my overall enjoyment throughout. However, the overall likeability of this new reboot will have division between its viewers. Those who spurned this during its pre-release will probably still harbor those same feelings, while casual moviegoers and (possibly Ghostbusters fans) will find some entertainment in this updated supernatural comedy film. It may not be as celebrated as it original, but Ghostbusters is, for what it’s worth, a solid relaunch of the franchise and with the potential for additional entries in the foreseeable future.